UPDATE: August 2009, SIGG bottles made prior to August 2008 contain trace amounts of BPA. I stopped buying bottled water a few years ago. It’s too heavy, too expensive and too too wasteful. •Tap water doesn’t taste good. •No handy water container to take on the go. I purify my tap water with a Brita water pitcher. One filter lasts a couple months. I keep the pitcher in the refrigerator so I always have cold water on hand. You can also buy filters that fit on the faucet, but I’ve had bad experiences with those breaking. It just so happens that Brita is having a Filter For Good campaign right now. You can take a pledge to reduce your bottled water consumption and get a coupon for Brita pitchers and filters. To solve the problem of having a water container on hand I used some plastic water bottles for years. However, Michael would complain about the water tasting like plastic after it had been in the bottle for a bit. So, yeah, I started to notice this too. That’s where SIGG came in. It’s made of a solid piece of aluminum — no plastic to leach. Tests have shown 0 leaching. The bottles are 100 percent recyclable, and the bottle lining is water-based and non-toxic. It’s baked into the interior walls, but does not crack. Another plus for me is the cool cap. You can buy a more traditional cap, but the one it comes with can also act as a nice handle. When I take it out shopping with me (because I always get thirsty), I can drop it into my shopping bags and not worry about it leaking. No snap top to pop off. Perhaps the biggest plus with my new SIGG is that the cat can’t dip his paws into it. How relaxing — I can leave it unguarded in the living room! SIGG bottles are also not as prone to leaking as plastic bottles can be. If the seal in the cap is worn, you can purchase another cap easily. The bottle itself is very durable. I can’t imagine anything crushing it. Maybe a giant Hummer might dent it though. Yeah, probably a Hummer would kill my SIGG. Where to buy? Whole Foods Markets, among other places. Go to SIGG for a complete list. I got mine from reusablebags.com. As you probably know by now, I’m so in love with them. Enough about my water bottle. What do you use? I wasn’t aware of these but this sounds right up my alley! I notice they sell cleaning supplies for them, too! Yay! Hi Bunnygirl. Yes, they do sell cleaning supplies to help you clean the inside of the bottle. The brush has a long handle and precisely placed bristles. Thanks for stopping by. Hope you get to have a SIGG! Tappening.com has really cool bottles. My entire high school has them. 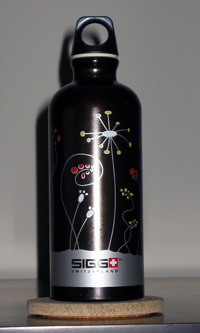 One of their bottles even looks a lot like a SIGG (who I had not heard of before). I saw a Cameron Diaz carrying a Tappening bottle on Access Hollywood and tracked down their website (tappening.com). The website is even cooler than their bottles. It is filled with information about tap vs. bottled water. The waste we create and pay for when we buy bottled water is really disgusting! I’ve never heard of Tappening, but it does look like a useful site. Hi. It’s great to make the switch to reusable bottles instead of bottled water. Filling from the tap is a smart move. But have you considered what happens to the plastic Brita water filter cartridges that are used up? They can’t be recycled and they end up in the landfill or incinerator. And I notice that you also wrote a piece about Burt’s Bees being purchased by Clorox. Did you know that Brita is owned by Clorox in North America? And here is a Yahoo Group set up to plan the campaign. Right now, we are just writing letters to Clorox. In the future, I’m hoping to set up a separate web site and petition. Would you like to help out by writing a letter too? Are you e-mailing letters to a certain address or mailing them snail? I currently have Nalgene bottles but I’m looking to switch. At first I looked at switching to Sigg but since the ingredients in the lining haven’t been disclosed and Sigg is still testing it’s products for BPA leeching I’m a little leery. It seems like the safest option is Klean Kanteens or glass bottles. Badhuman, the interior is water-based and tests have shown zero leaching. It exceeds FDA requirements. I’m glad that your Sigg is working out so well, but just a word to the wise: be wary of dents. I have a Sigg and I used to carry it around in the side water bottle pocket of my backpack. Just the impact of placing (not dropping) my backpack down onto hard floors (tile, hardwood, etc.) has severely dented it. It now sits on a shelf gathering dust, and I use a cheap knock-off that so far appears to be much sturdier than the Sigg. It may depend on which style you have, I have read mixed reviews about denting. Hope your bottle remains dent free! Hi Dot. Thanks for visiting. So far my SIGG is dent-free. resuablebags.com is now selling the 2008 SIGGs if you want to give it another try. Hey guys I made a video against bottled water, Its a magic video! David Blaine EAT YOUR HEART OUT! Oh I also talk about Tappening so ENJOY! Hi, I love my Sigg(s)! They are supposed to get dented up, by the way. Be proud of your dents! Also from Dollar store, pick up a baby bottle brush, if your Sigg needs some scrubbing from having juice or something in it. You Sigg is not supposed to be put in the freezer, so beware of leaving it in the car in freezing nights as well. HI Peggy, nice blog. I recently jumped on the SIGG bandwagon because the information of leaching had got to me. I promptly discarded my Nalgene bottle and looked for an alternative. Needless to say, SIGG does not need any endorsement; first look and I can see why. It’s love at first sight. Unfortunately I arrived to the party a tad late and trying to order these online is impossible. I went to eBay and I’m (somewhat) happily enjoying my SIGG as I type. The interlocking grooves at mouth seems to be getting discoloration after one use. The coating in side feels like latex/rubber but it looks very uninspiring; almost as if it’s untreated metal that you typically find in canned goods. My question to you and anyone who may be endowed with the information is; how do I tell if mine is a fake? Curtis, I hope you didn’t get a fake! I suppose it all depends on how honest the seller is. And of course the SIGG logo. SIGG is a great brand! I personally prefer stainless steel bottles because there is no liner; however, I have a few friends that use SIGG and love their bottles. This was a great article, please keep more coming in the future! Lately, I’ve been using my Thinksport bottle more often. It’s so great at insulating. Thanks for visiting, Emily.